We spent 20 hours researching and testing 12 different kinds of inline skates and found that comfort, size availability, and frame material were most important. K2 Men’s Kinetic Inline Skates scored high marks in all categories and is our top pick. These inline skates had less road vibration than other types due to the composite material that the skates are constructed from. The low design makes these skates perfect for beginners. The stability cuff gave plenty of ankle support while we were skating and reduces the amount of shakiness new skaters experience. The boots are soft and comfortable too. Inline skates are different from regular roller skates in that the wheels form a straight line rather than being 2 forward wheels and 2 rear wheels. The top rated inline skates we’ve reviewed here are customer favorites for many reasons that we will share with you so you can understand what makes one pair better than another. Inline skates are still popular, more so than traditional roller skates, due to their durability and performance on sidewalks and streets. They are great for street hockey, exercise and even as a form of transportation if you don’t have too far of a distance to travel. Thanks to their ease of use and faster speeds, inline skates have long since surpassed roller skates as a preferred method of skating. In addition to reviewing these top rated styles, we have provided a buyer’s guide to help you learn even more about inline skates in general. This information will help you navigate the choices out there and decide which styles and types are the best for you. 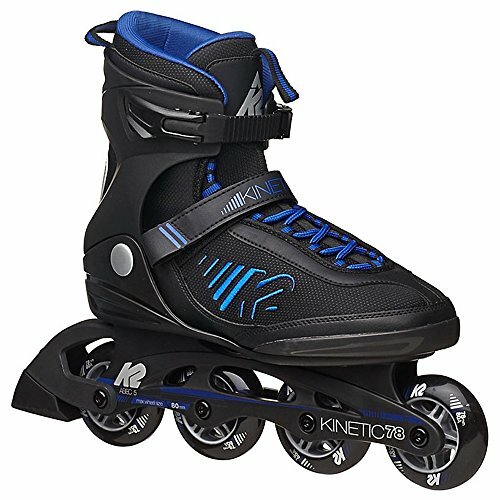 If you love to skate for fun and exercise, you will enjoy the Kinetic 78 by K2. It is designed for beginners and intermediate skaters alike and provides comfort as well as performance. You will enjoy less road vibration thanks to the composite material that is designed to take the vibrations from the road and absorb it for more user comfort. The lower to the ground design makes it great for beginners that need extra help balancing. There is plenty of ankle support with the Stability Cuff that gives new skaters more confidence since they don’t feel so shaky when getting started. The soft boot is comfortable to wear and the traditional lacing style means you can control the amount of tension in different areas on your foot and ankle. You will enjoy learning a new skill with these skates or if you are an intermediate skater, you will benefit from the stable and comfortable design as well. They are the perfect pair of inline skates for someone interested in the activity but unsure of how they will do and the price is great too. Even if your child is just starting out on inline skates, you don’t want to get a substandard pair. Having quality will give them a great start in this fun and healthy activity. The Spitfire has a lower center of gravity which means it is easier to balance which is a huge plus for beginners. The superior design provides comfort, easy closure and it is adjustable as well. The available sizes range from kids 11-1, 2-5 and 5-8 which mean that they are the perfect skate for growing kids. The lower center of gravity they provide help with balance making them a terrific choice for beginners who are usually very unsteady. The brake makes stopping much easier and is included on the skate. 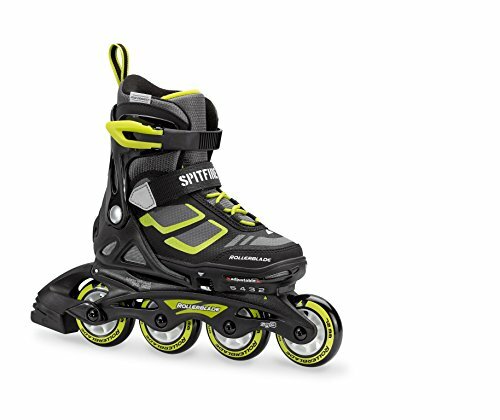 The Spitfire is a lightweight and really sharp looking inline skate that your child will love. If you’re looking for the perfect starter skate you will have a hard time finding anything better than this one by Spitfire. The features make it very popular with adults and kids alike. Not only are these inline skates great to look at, they are comfortable to wear as well. The reinforced nylon frame is adjustable so you can get a great, custom fit. All you have to do to adjust the skates is press a button and you can get the fit you want. The comfortable, soft boot has three buckles in a cam lever style and the comfort padding makes wearing them easy and enjoyable, even when you’re exercising. They are perfect for outdoor use. They adjust from a 6-9 and are great for beginning to intermediate skaters that are looking for a durable, yet comfortable skate for their activities. Whether it’s exercise or weekend roller derby, you will enjoy the sleek look and design of these inline skates. The eye catching wheels are lavender which goes great with the gray plastic frame and black nylon insert frame. You’ll be ready to exercise or play when you choose these great women’s inline skates. These top rated inline skates that we have reviewed here are consistently customer favorites thanks to their ease of use, comfort, durability, low center of gravity and adjustability. Any one of them is perfect choice for the beginning inline skater. Just because you are just starting out in an activity doesn’t mean you have to sacrifice quality in the equipment. In fact, if you do your research and get the right skates that will make inline skating enjoyable, you or your child will be a lot more likely to continue it. No matter which inline skates you choose you will experience excellent comfort and improved balance with any of these styles. If none of these strike your fancy, check out buyer’s guide for more in depth information on inline skates and learn how to narrow the choices down so you can choose the ones that will work for your needs and preferences. Inline skates are specifically designed skates that took the regular roller skating craze by storm. 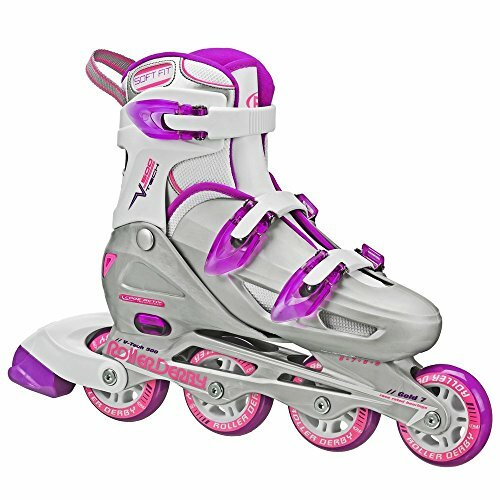 Whereas regular skates have 4 wheels; 2 front and 2 rear, inline skates have 4 wheels also but are designed in a straight line. This layout enables the skater to have much greater flexibility and movement that is very similar to wearing ice skates. Roller skating has been around since the early 1900s but it wasn’t until the 1990s that inline skating began to take over. The biggest name in inline skating, Rollerblade, was created by two brothers from Minnesota that found an old pair of inline skates in a local sporting goods store and they improved on the design originally for hockey players so they could practice off- ice. Now it is used for recreation as well as exercise and there are even inline sports that one can become involved in as well such as X games. Manufacturers are competing to come up with the best designs and products to meet the demand inline skating brings with it. Because of that demand, buyers have an array of choices when they are looking for inline skates and that can make the decision process a bit more challenging. There are several types of inline skates available. What determines which kind of inline skate you need is the type of skating you want to do. We have outlined each of the types below. Recreational Inline – This is a general, all purpose type of bike that is great for flat surfaces both indoors and out. This style of inline skate is best for casual use. Recreational inline skates are good choices to use for beginners who are just getting started with inline skating due to the generous flex. Fitness Inline – The inline skates that are used for fitness skating are typically much more high end and lightweight than recreational models. They have a larger wheel diameter and are guilt for endurance while maintaining a streamlined quality as well. This design enables the users to achieve faster speeds during long distance skating and oftentimes are used for training for ice skaters and hockey players. Street Inline – This style of inline skate is used for urban skating. They are very rugged and durable and contain a short wheel frame which makes them the best design for skaters who want to learn tricks and rail grinds. Racing Inline – If you are looking to go as fast as you can, racing inline skates are what you want. They are designed specifically for smooth surfaces and can handle fast speeds due to the thinner and larger wheels. These models are extremely lightweight and use carbon fiber to gain extra support. The boot of the inline skate is made up of several elements. The boot is important because of the comfort and support it can, or cannot provide depending on the type of skating you plan on doing. Below are the main components of the inline skate boot. A good boot is crucial so you have the best ankle and foot support possible. Hard Outer Frame – The hard outer frame isn’t as prevalent as it once was. The sad part about this is that the hard outer shell provides the best ankle support you can get and will also last longer than those that do not have it. If you have previous ankle problems or are larger in stature, having this hard boot can really benefit you and prevent injury or re-injury. Soft Frame – Because a soft frame is more comfortable, manufacturers have begun designing their inline skates with a soft shell rather than the hard one. Comfort is definitely important and soft shells offer that, but you must ensure that the boot offers the right amount of support. The issue with soft shell inline skates is that the fabric around the ankle can break down over time which offers the user less support as time goes on. If you are small or have really strong ankles, a soft shell boot will work fine for you, but if you have any previous ankle injuries you may want to opt for a harder shell. Boot Liner – The boot liner fits into the skate and can be removed. You want to be sure that the liner and boot fit well together when your foot is in the liner. As with any product, there are some inline skate models that have better quality boot liners than others. More expensive models offer moisture control that will enable your foot to breathe better which reduces foot odor and other foot problems that can be caused by excessive dampness. Foot Bed – There will be a foot bed inside the boot liner of your inline skate. Both the liner and the foot bed are removable and can be washed as long as you put both inside a pillow case before tossing into the washer. The pillow case will protect the liner and foot bed from being damaged. You can also choose to remove the existing foot bed and replace it with custom orthotics as well if they are needed. Laces – Hockey skates, dancing skates and racing skates will often have laces due to the fact that the laces provide the ability to have more control over the tension of the skate. Laces don’t provide the same level of support that buckles do and they can loosen as you wear them but for those who play hockey or dance or race, they still tend to go for the models that have the laces. Buckles – The buckles on an inline skate are permanent and are attached to the skate. They can be adjusted with the sliding mechanism and some buckles have other options as well for proper adjusting. Once you find the right buckle position, it usually stays in that position every time you skate and it’s much easier to have that consistent fit every time. Combo Laces/Buckles – This type of model has the best of both worlds and is most often found in some recreational and fitness inline skates. Typically the buckles surround the ankle area for maximum support and the laces are adjusted over the top of the foot. They take longer to put on but if you’re looking for maximum support, this combination can give it to you. When shopping for a good inline skate, try to ensure that it has the following features. These are the things that will make your skates perform better, fit better and last longer. Comfortable – You want the inline skate to fit snugly on your foot and ankle and you should be able to flex forward at the ankle if needed for balance. A boot that is too snug can be uncomfortable and even painful. Beginners need to focus on finding inline skates with more supportive cuffs and advanced skaters may prefer shorter, flexible ones so they can skate more aggressively. Good Ventilation – Ventilation is so important in a skate because this prevents the foot from becoming damp and hot. When you are working out or participating in an inline skating sport, you don’t want to have to take your skates off and wring out your socks afterwards. Not only is this uncomfortable, it can cause skin issues of the foot as well. Durable Bearings – If you are interested in fitness inline skating or skating just for recreation, the type of bearings your skates have isn’t of as much importance. If you are racing, then you want to find skates that have a very high ABEC or ILQ number. The higher this number is, the faster you can skate. The Right Wheels – The type of wheels your inline skates have will depend on the type of skating you will be doing. For aggressive skating you will usually find the smallest wheel size and it goes up in order from smallest to largest with hockey, general fitness skates and speed skates. Secure buckles – You don’t want your inline skates coming loose while you are speeding down a hill or trying to get in a good workout. The quality and security of the closures is very important to the overall fit and comfort of the skates you have chosen. This is a problem that is usually seen in low quality inline skates, so if you are careful to choose the better quality models like the top rated choices we reviewed earlier, you should not have this problem to deal with. If you have decided to take up inline skating, or you have been skating for awhile and want to take it to the next level, having the right information can be helpful in determining the right skates for your needs. With the information we have provided for you in this buyers guide and the top rated reviews we did above, you have all the information you need to narrow down your choices and come up with a great list of potential models for your needs. Once you have created that list, you will know what features to look for and how to decide what type of inline skating you will be doing. Once you choose a pair, you will be confident that you will enjoy using them and get the best performance from them as well.